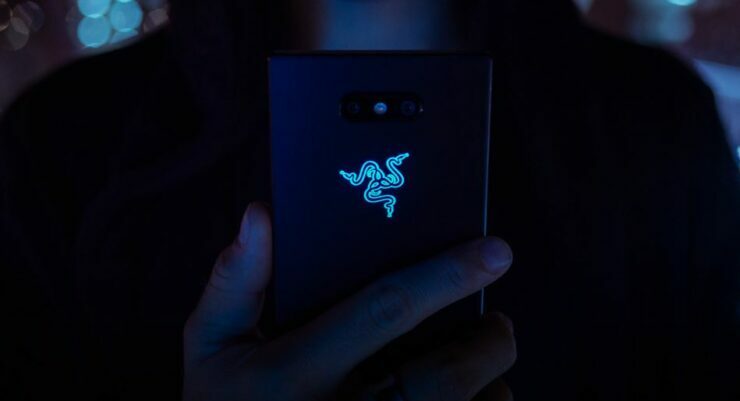 Razer Phone 2 is now finally official after a series of leaks over the past few months. The company announced its latest flagship for the year 2018 with a plethora of improvements, new design, and major upgrades compared to its predecessor. Moreover, the device packs all the necessary goodies for mobile gaming and its rising trend. 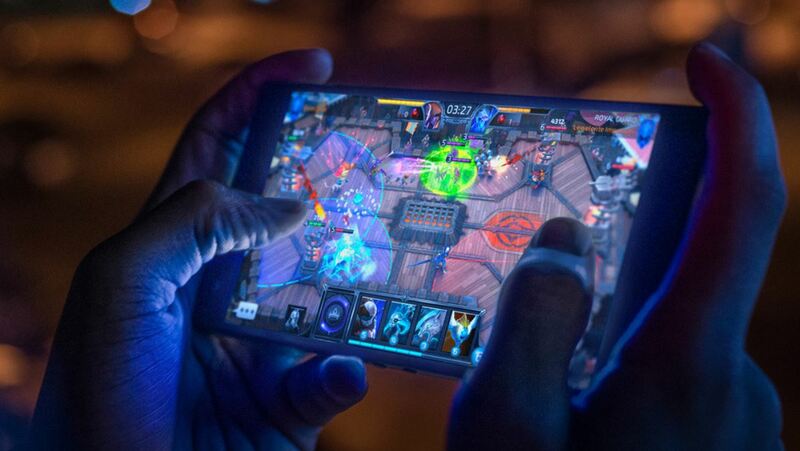 So let’s dive on to see some more details on the Razer Phone 2 and what new upgrades does it feature compared to its predecessor. We will be covering several aspects of the Razer Phone 2 ranging from internal specifications to the external design and the display tech as well. Let’s begin with the gaming features which the smartphone is oriented towards. The Razer Phone 2 has a 5.7-inch IGZO LCD panel with a QHD resolution. The device still rocks the 16:9 aspect ratio and according to the company, it is the best for multimedia consumption at this time. the display is now 50 percent brighter than before reaching a staggering 280 nits. The company has also emphasized that the is best for keeping details even in dark scenes. The 120Hz display which we all fell in love with last year is carried forward with the Razer Phone 2. It eliminates the lags and stuttering and tearing of the sensitivity. This makes the display more sensitive and responsive to touch. It also supports HDR and DCI-P3 wide color gamut to enhance visuals in both videos as well as games. As for what’s powering the device is the Qualcomm Snapdragon 845 chip coupled with a new vapor chamber cooling system. Razer’s focus was greatly emphasized on the device’s thermal throttling, and it seems it won’t be the issue. 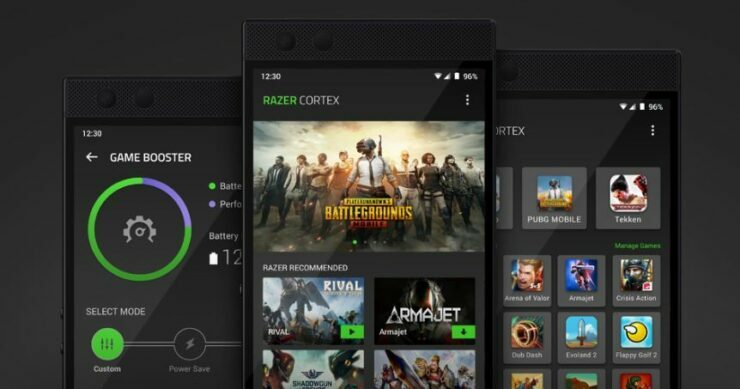 The Razer Phone 2 still features 8GB of RAM and 64GB of UFS storage. The storage is nothing fancy but you do get a microSD slot for storage expansion. The battery capacity is still kept at 4,000mAh which is not bad and keeps up with the Galaxy Note 9 and other flagships. However, this year we get support for fast wireless charging up to 15W and Qualcomm’s QuickCharge 4.0+ for wired charging. The Razer Phone 2 still features a top and bottom bezel. However, it houses the dual stereo speakers inside which have been slightly tweaked for better audio. the speakers are Dolby Atmos-certified and each of the two speakers has a dedicated amplifier. Last year, the Razer Phone did not feature wireless charging due to its design limitations and the metal housing. 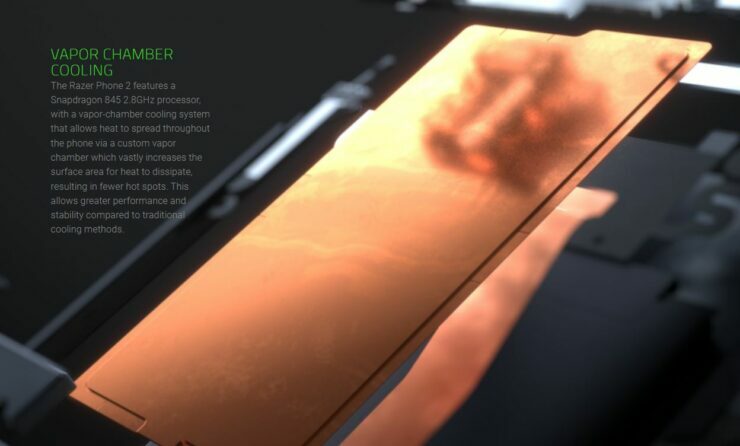 This year, the Razer Phone 2 comes with a glass back while the body of the device is still CNC-machine aluminum. It is now water resistant with the IP67 rating, so that’s a major plus as well. Speaking of design, the Razer logo at the back is RGB backlit and also supports Chroma. What this means is that the logo at the back will illuminate the LED lights with the lights on the phone. However, we do not see a headphone jack. 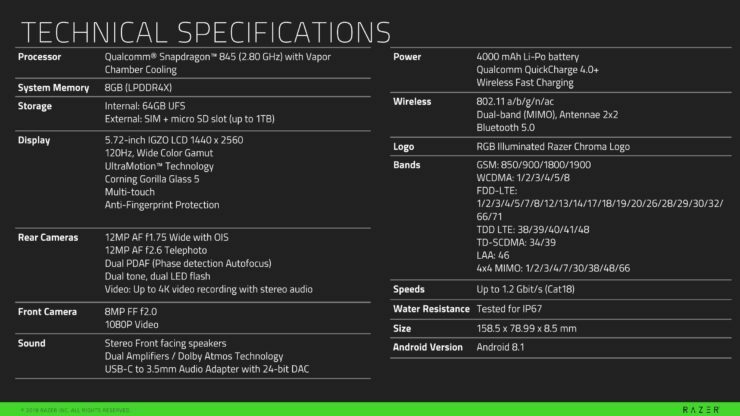 To accommodate, Razer has bundled a 24-bit DAC dongle with the phone, so you can make use of your older headphones. The Razer Phone 2 incorporates dual cameras at the back which have been significantly improved from its predecessor. There are two 12+12 megapixels Sony cameras which have now gained Dual Pixel AF and OIS with a f/1.75. the second lens is a 2x telephoto lens with f/2.6. 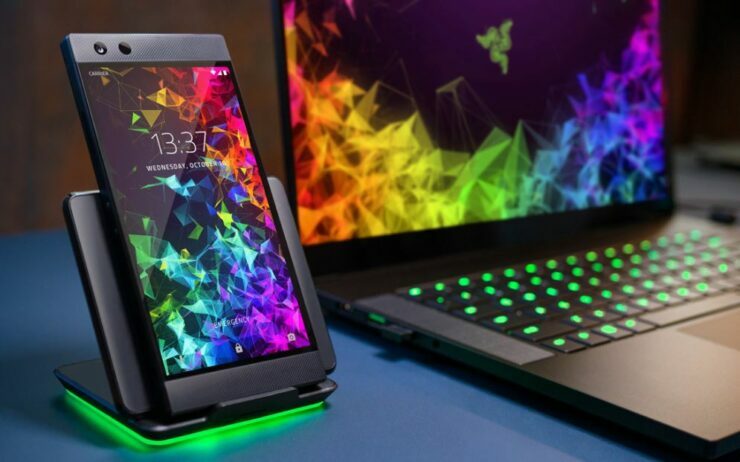 Alongside the Razer Phone 2, the company has also released the Razer Raiju controller, razer Wireless Charger, Leather and Kevlar Case, tempered glass protectors and the Razer Hammerhead USB-C headphones with RGB lighting. The Razer Phone 2 will run on Android 8.1 Oreo out of the box which will be upgraded “soon” to the latest Android build. You can now preorder the device starting today coming at $799. There is also a premium Satin finish version which is slightly expensive, coming in at $899, coming later this year. Also, check our dedicated hands-on with the Razer Phone 2 for more details. There will be more to the story, so be sure to stay tuned in for more details on the Razer Phone 2. This is all for now, folks. What are your thoughts on the matter? Are you willing to get one for yourself? Let us know in the comments.